Is the remedy for active managers’ well-known performance difficulties to become more active? Some observers think so, and argue that less diversified, more concentrated portfolios should be the wave of active management’s future. But there are a number of adverse consequences to concentration — for example, risk is likely to increase. A second consequence is that in manager evaluation, the importance of luck will increase relative to the importance of skill. While some managers may be skillful, none are infallible. A manager who is skillful but not infallible will benefit from having more, rather than fewer, opportunities to display his skill. A useful analogy is to the house in a casino: on any given spin of the roulette wheel, the house has a small likelihood of winning; over thousands of spins, the house’s advantage is overwhelming. The chart below illustrates the concept. In a coin-flipping game with a biased coin, we “win” if more than half our tosses come up heads. We play with two coins, with a 53% and a 55% chance of heads. The probability of winning grows as the number of tosses rises and, for any number of tosses, the chance of winning is higher with the more favorable coin. However, if the number of tosses varies between the two coins, at some point, it is preferable to have a worse coin and more tosses. The analogy to security selection is straightforward: instead of flipping a coin, a manager picks stocks with a given probability of outperforming the market. If more than half his picks outperform, the manager “wins” the game. The more picks he makes, the more likely it is that his skill dominates his luck. As with the coin-flipping game, for a constant number of stocks, a more skillful manager is more likely to outperform than a less skillful manager. But if the number of picks varies, an asset owner may be more likely to outperform with a less skillful manager who holds more stocks. 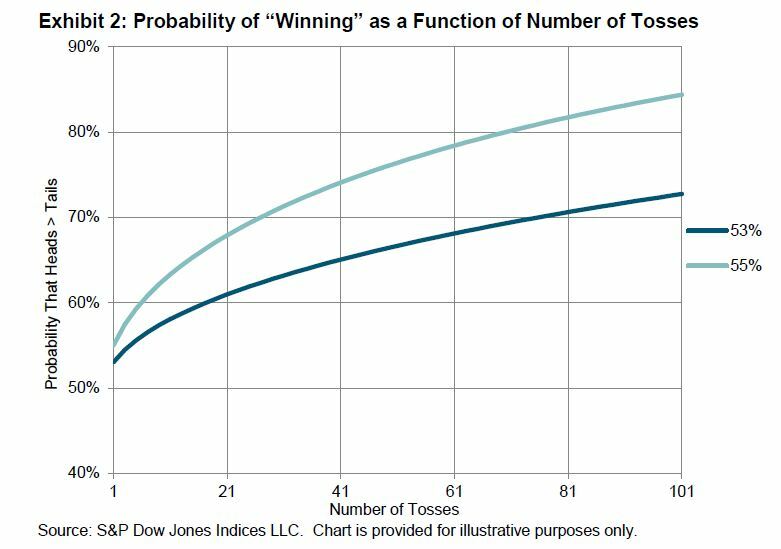 An unskilled manager has a better chance of winning the game the smaller the number of tosses (just as a skilled manager has a better chance the more he tosses). Concentrating portfolios makes it more likely that good managers will look bad, more likely that bad managers will look good, and more likely that asset owners’ decisions will be informed by luck rather than skill.